Next in my series of ‘too poor for a new camera so be content with one decent smartphone photo’ blog articles, I present you Terry and Debbie; a lovely couple from the great state of Washington, at the beginning of their self-guided tour. The sun was shining and the winds had not picked up at this point. I have not heard from them since I left them at the Imperator this morning, so this can only be good news. Bonne Route you two! Focus road bikes supplied by our friends at VeloRoo. 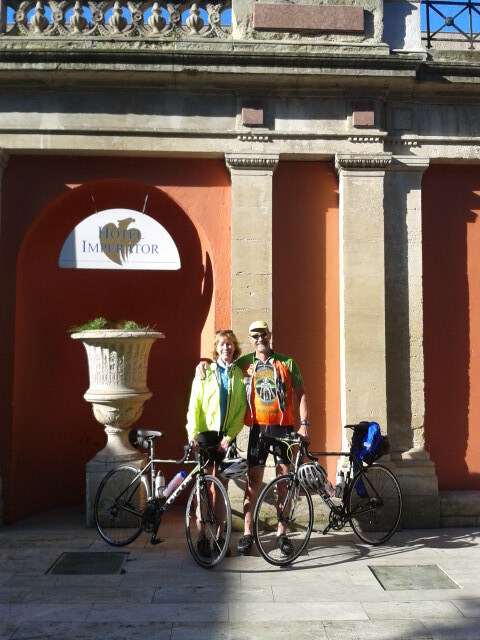 This entry was posted in Cycling and tagged hotel imperator, Veloroo. Bookmark the permalink. Coming from you, I’ll take the compliment gladly, Stephen! The quality is miles better than my old iPhone, too. Would be nice to have a little bit of a zoom, though.